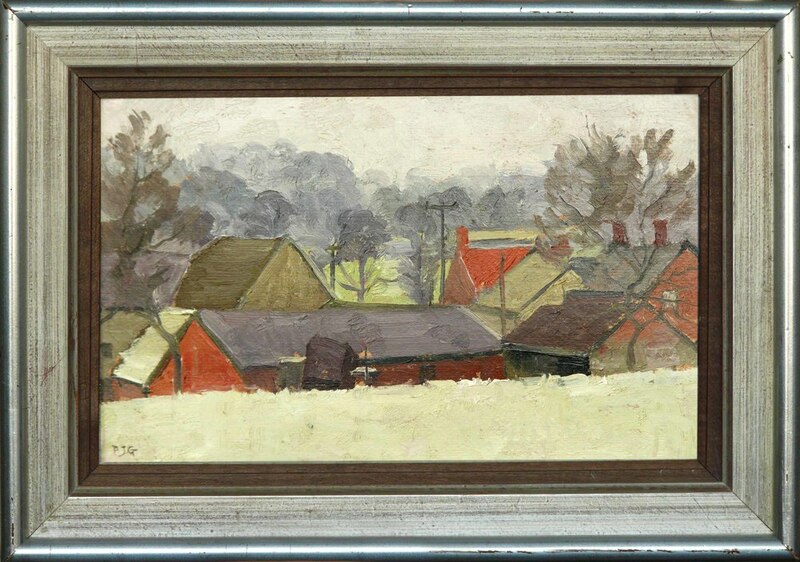 Completed with a limited palette, this winter scene in a small Northamptonshire village draws on the geometric forms created by a series of rooftops. The appeal lies in the almost abstract arrangement of warm, earthy coloured parallelograms and triangles, juxtaposed with the wintery blues of distant trees. This approach to composition can be seen in much of Garrard’s work where the success of the arrangement often relies on rigidly interconnecting shapes such as those delimited by architecture, tree branches or rocks. Peter John Garrard, born in 1929, became involved in the organisation and adjudication of numerous international painting competitions, notably chairman of the judges of the Spirit of London Painting Competition since its inauguration, and judge of the Space Coast Arts Festival in its bicentennial year. In 1981, he was invited by the Australian Guild of Realist Artists to take part in their seminars and to undertake a lecture and demonstration tour in and around Melbourne and Sydney. A writer of articles on painting and art history, he was an occasional editor of The Artist, Creative Crafts and The Artists Trade Magazines, and was author of the Artists’ Guide (published 1976). During his lifetime he was elected as a member of the New English Art Club, Royal Society of British Artists (for which he served as President between the years 1982-87), Royal West of England Academy, Royal Society of Portrait Painters, Contemporary Portrait Society, Brother of the Art Workers Guild, and an Honorary member of the Royal Art Society of New South Wales. In 1976 he was awarded the de Laszlo Medal at the Royal Society of British Artists. Examples of his work can be found at the Royal Academy of Arts, and Leighton House Museum.